“A good book… leaves you wanting to reread the book. 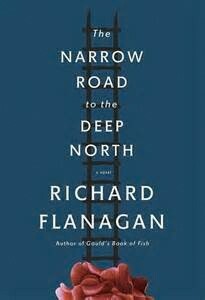 A great book compels you to reread your own soul,” says Dorrigo Evans, the lead character of Richard Flanagan’s The Narrow Road to the Deep North. There’s a whole lotta soul readin’ over here. Flanagan said it is the book he knew he’d have to write if he kept on writing. For him, it is deeply personal – his father, a survivor of the horror the novel depicts. The Narrow Road to the Deep North won the Man Booker Prize in 2014 and fully deserves it. Narrow Road centers around a group of Australian POWs who worked on the Thailand-Burma Death Railway in World War II and particularly during a phase called “Speedo” where prisoners were forced to work double shifts in order to make faster progress on the line. Like many WWII novels, the depiction of the conditions are at times unbearable. There were moments in my reading when I thought, “No wonder this won the Man Booker – the judges felt that if they had to endure reading this book twice, it better be for something!” In all seriousness, the descriptions of the dysentery, lice, cholera, beriberi, skin ulcers, scurvy, not to mention the all-out beatings, are the most emotionally draining I’ve encountered. Dorrigo Evans is a physician by trade. He’s assigned to lead his fellow POWs – which means that when the Japanese come to demand that 400 men go to work when only 100 are well (and in truth Dorrigo knows there are none) he has to determine which of the ill he will send out to what is certain death. He has nightmares of these choices for years after the war. Despite his own grappling with guilt and unworthiness, his men love and respect him. Dorrigo is not only haunted by the experiences on the line. He also carries with him memories from a brief affair with his uncle’s wife that he had two years prior to the railroad. Initially it is Amy that seems to carry him on a wave of hope that there is something beyond what he’s living. But in the years post-war, you understand that he believes he’s been changed in ways as fundamental to him as his DNA. Flanagan doesn’t just follow Dorrigo. He give you glimpses into what others struggle with – from the Japanese Commander Nakamura on his way to the gallows to a fellow POW whose journey into dementia as an old man finally makes him a free man. This review will fall short of giving due honor to the novel it applauds. The Narrow Road to the Deep North is more than just an exploration of war and love and what one does to the other – which it is. It does that which leads Dorrigo to call a book great.